Focusing on Tanks – Thermal & Rainwater Storage | What's NEW at EcogenBuild? Well, its been a while since the last entry, during which some much needed holidays were enjoyed. Since coming back from our vacation, the main focus of our work has been on the storage and rainwater tanks, with a little bit of concrete work for some diversity. Work is even slower now because it is largely just Nick & I, although I have been blessed with friends that drop in when I need it. James, Fred, Arn, Jim and Karl have been very helpful in this regard. James is an integral part of the team but his day job gets in the way. He’s been there at every stage and always has that tool that we seem to be missing. Recently, Fred dropped in to help with some EPS work and Arn came by to help with the concrete, as did Karl. Both Arn & Fred also helped us offload the 53’ trailer of EPS on a very hot day about a month ago. Amazing how much foam can weigh when you deal with such a volume of it. Jim was there throughout the foundation stage and will join us again for the framing. Thanks guys! It turns out that I have a lot I want to say about the storage tanks, but before I do I’ll mention that we had a successful, albeit tough, day placing and finishing the garage and shed floors. It’s amazing how fast 32 MPA concrete sets up, especially when there is sand and not poly beneath it, a shining sun, and a dry wind. 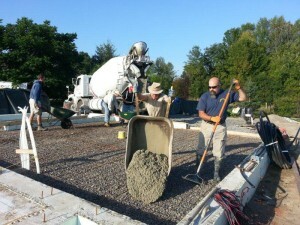 We had just finished placing the concrete in the shed when we had to move on to power-trowelling (floating) the garage. Likewise, there was no gap between floating and final trowelling. It went quickly. Thanks to the crew who kept going throughout and didn’t mind foregoing coffee break and taking their lunch at 2PM! Insulating the thermal storage tanks, like almost everything about this build, seems simple in concept but has its challenges in practice. The biggest challenge was matching the variations in the walls and the rigidity of the large, thick EPS sheets. The ICF walls of the tanks were pretty good for dimensions and squareness, but we found curves in the walls at the t-sections (where walls joined). These irregularities were enough to put gaps between the EPS sheets and the ICF; gaps that we had to deal with. Gaps led to sheets not fitting perfectly squarely or being slightly offset relative to each other (in/out from the wall). Our adaptation was to offset the seams in each layer and at corners. We also used spray foam to fill in any resulting gaps between sheets in the same layer. 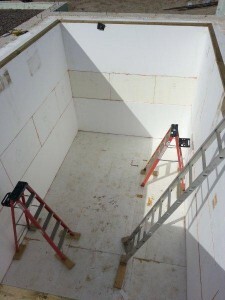 Spray foam is a wonderful material, but care must be used in its application. If not, it can get in behind a joint and push a sheet out from the layer behind it, thereby creating an unwanted gap. It can also expand too much and push an unconstrained sheet too far. Clamping a sheet or placing a brace on a sheet when foaming may be appropriate. We also used some EPS glue to hold sheets together or to adhere the reinforcement “rims” of the tank in-place, but largely we used interference/friction fits to keep sheets where they belonged. Between the friction fits, expanding foam and glue, everything is now in its place which is all we need until the liner is on and the water is in the tanks. After that, the water pressure with keep them where they were put. The Long Term Storage (LTS) tank helped us get through the EPS stockpile quickly. Its media volume (the volume up to the overflow/pressure relief vent) is 59 cubic metres (m3). The volume of EPS is 62 m3; about the same as the storage volume. If that sounds like a high percentage, our High Temp Tank (HTS – the tank we want to keep consistently at higher temperatures), has a media volume of 6.5 m3 but with slightly thicker insulation it has 18.3 m3 of EPS, giving it a ratio of almost three times insulation to storage media! At the risk of being geeky about this – with all these numbers floating around – I will add that thermal storage has the potential to be more cost-effective than battery-based electrical storage. Based on the useful temperature range of energy storage, the system we are building can store over 2,800 kWh of useful thermal energy, mostly in the LTS tank. When I look at off-grid power storage in lead acid batteries, I see costs over $300 per kWh of useful storage just for the batteries, assuming the batteries don’t discharge below 50% on a regular basis. I know this comparison is really “apples and oranges” (i.e. unfair because of their differences between thermal and electrical energies), but it does highlight the fact that thermal energy storage can be a very useful tool in a carbon-constrained world or in an off-grid setting. Before I get beaten up by proponents for electrical storage, let me first say that I believe that everything has its place and that electrical storage is also important. Proof in the pudding: we plan on installing a grid-interactive system in the house (grid-interactive is essentially an off-grid system that is connected to the grid and can share its excess, or get “topped up” when required). Battery storage has its own way of being cost-effective in certain applications. According to an article written in The Guardian, the world’s largest private bank states that solar generation coupled with electrical vehicles and electrical storage at home will put central generation stations onto the decline in Europe by the end of the decade. I can see it happening there, and maybe even here if we begin to account for the economic externalities of carbon. Last point on storage, if we really want to look at the cost-effectiveness of energy storage, we would have to consider how often the energy storage is used (i.e. cycled up and down). Storage systems yield diminishing returns the longer the cycles are (time frame between periods of benefit). With a seasonal store it is only once a year, although there are ups and downs on daily, weekly and monthly scales. 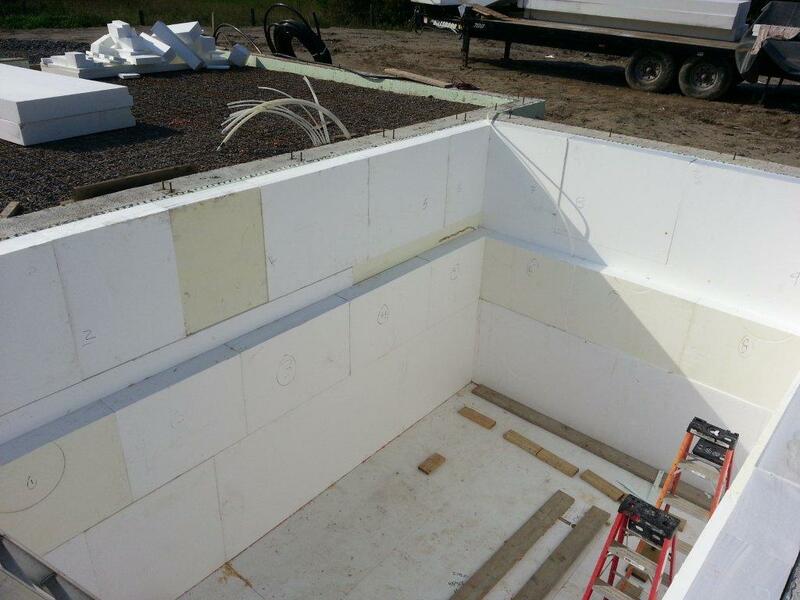 Additional benefit can be derived from the storage by linking a greenhouse or pool into the thermal store system, thereby increasing its value. With electrical systems, cycling up and down occurs almost always on a daily or weekly basis. They are generally more cost-effective, but I’ve never heard of anyone using one to store energy for heating (either space or DHW). I don’t want to claim that this project has found the magical mix of the two storage technologies. Each project will have its own balance point based on owner values, project objectives and budget to name a few factors. However, our project strikes the balance that Clare & I are looking for; cost is important but the over-riding concern is reaching our goal of not burning carbon and being totally thermally self-sufficient with solar thermal energy. I do know of other ways to get to the same point – perhaps even more cost-effectively – and look forward to working with future clients to get them there, but this particular solution offers us the benefit of relatively simple technologies (no heat pumps) and has ultra-low electrical consumption, yet will provide all the comforts of a fully heated and cooled house. Tank liners are the next stage of the build. 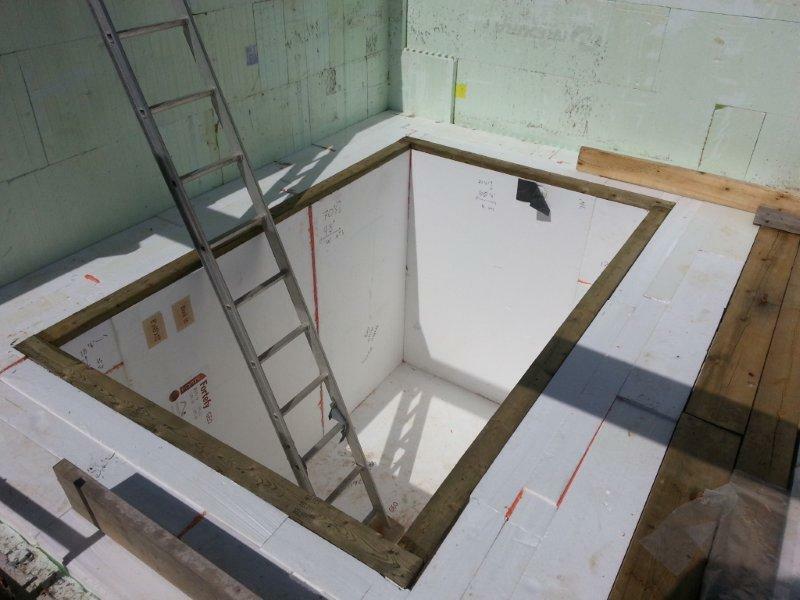 Now that we have the as-built tank measurements, we can prepare and cut the very large EPDM sheet into the various liner and lid sections. This is a creative process that is as much drafting as origami. Measurements are used to sketch out the total linear lengths of liner material required to run from the anchor point on one side of the tank to the anchor point on the other. The same for the other dimension. Then the sheet is cut out and folded with nice “hospital corners” (ahh, those memories of army recruit training and crisp 45° bedsheet folds) and cuts are made to accommodate compound outside corners. Maybe the prep work is not quite origami, but it is good to practice at a smaller scale with paper than to make mistakes with the very expensive, heavy, unforgiving EPDM. All this may seem simple – and in principle it is – but installing huge sheets of EPDM is heavy and unwieldy work. Further, once we have it in-place, we’ll have to deal with the variations in thickness that the folds will introduce, so we’ll have to do more cutting and gluing of extra layers to ensure that we get good seals between the tanks and the lids. I don’t expect that stage to go very quickly, either! As I close out this blog entry I want to say that I hope to be able to write in two week’s time that the liners and lids went in reasonably smoothly and that we’re starting on floors and framing. For those who can do so, try to make it out for a visit on 4 October for OSEA’s Green Energy Doors Open event. We’ll be on-site from 8 AM to 4 PM. Great blog entry! Sorry I won’t be able to make it to the Open House on October 4th as I’ll be out of town. Hopefully they’ll be another opportunity. Best of luck! Just wondering how you did with the EPDM? About a year away from purchasing a home in Halifax Nova Scotia. Water security is on the short term project list. Hope everything is going smoothly!